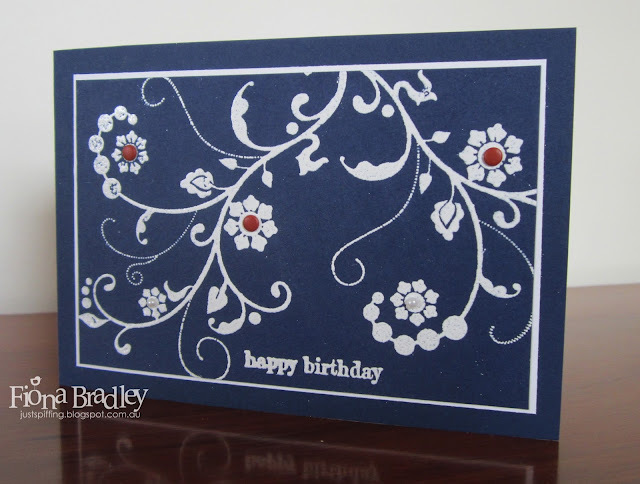 I like the femininity of this card even though it is using such a dark blue. I think it makes for a wonderful balance! I found that using both Kraft ink (white) and white embossing powder were needed to give the full coverage that you see here. Inspiration from: Stacey Ailes - thanks so much! Wow! Great card, I also like the contrast of the dark blue! Thanks so much, Nicole! It's quite striking, isn't it?